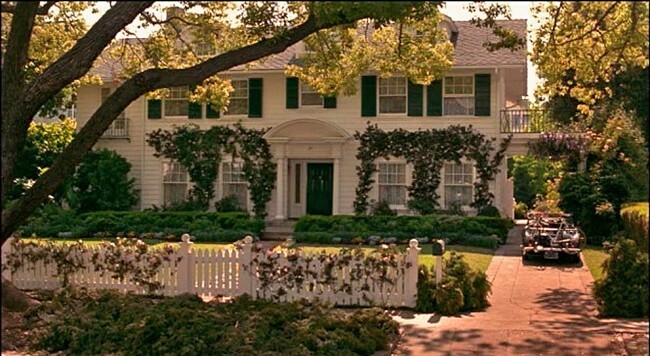 Have you ever dreamed of living in the Father of the Bride home? Ever since I was a child I dreamed of laying in the hammock in their backyard, and joining the family for their family dinner. Here's Wikipedia's synopsis on this movie favorite from 1991. 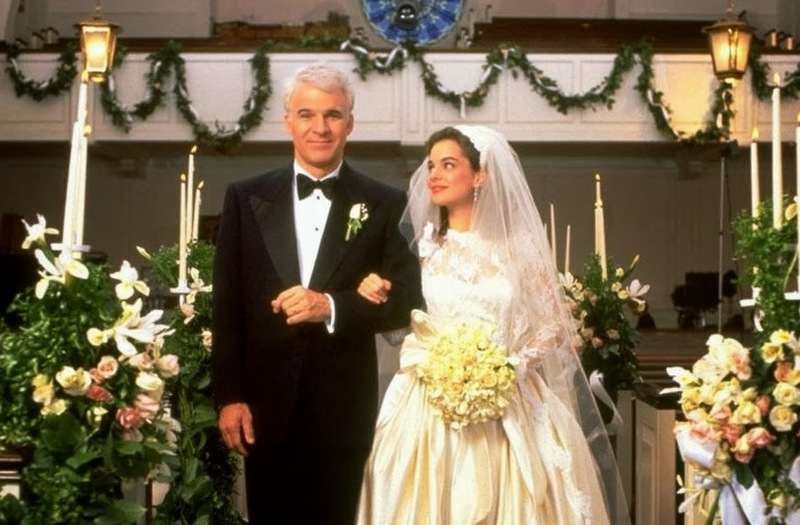 "George Banks (Steve Martin) is an upper-middle-class owner of an athletic shoe company in San Marino, California, whose 22-year-old daughter, Annie, (Kimberly Williams) has decided to marry Bryan MacKenzie (George Newbern), a man from an upper-class family from Bel-Air, despite only knowing each other for three months. 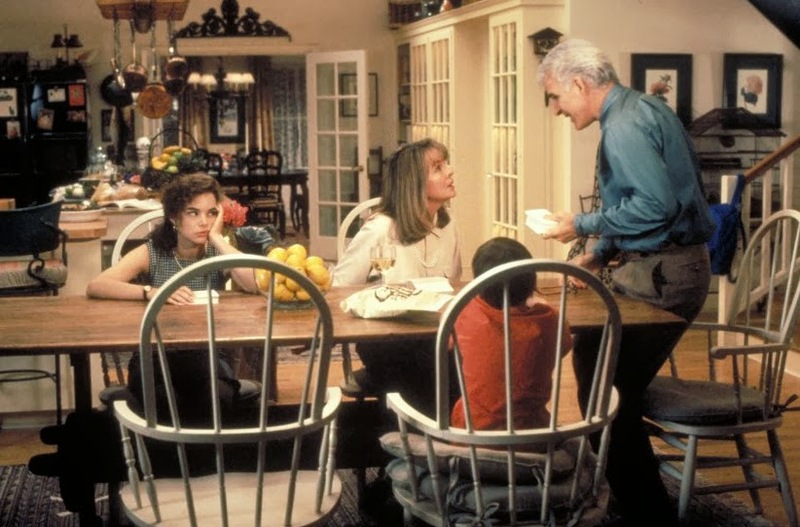 George can’t think of what life would be like without Annie and becomes determined to make the upcoming ceremony as inconvenient as possible (especially when he finds out the wedding will cost him $250 per head), although his wife, Nina (Diane Keaton), tries to make him happy for Annie. When the wedding takes place at their home, along with an eccentric wedding planner named Franck (Martin Short) taking over the ceremony, George tries to handle the fact that Annie has grown up and has a life of her own." The home located is located on Maple Drive and what 1990's movie doesn't start without a bike riding by? It looks idyllic with the white picket fence and charming green shutters. To the left as you enter the Banks' home is their living room. It is a mixture of formal with it's focal points and furniture arrangements, yet informal with it's materials. I just love the creamy butter walls throughout and the crisp white trim. Opposite to the living room is a picture perfect dining room. The French provincial table and chairs, make this home feel informal, yet full of character. It's as if the set designers wanted us to feel comfortable within their home as we watch some of the Banks most precious moments. Nina Banks in her kitchen, which if appliances were changed is timeless. The dining room is set behind the double glass doors. Below you can also see the breakfast table where they sit informally to look at wedding invites. Let's go look at George and Nina's bedroom. Notice throughout the house almost all the pictures are floral which creates a sense of unity between all the rooms. The bed side tables are different too, creating a sense of different personalities, done in most set homes. Annie sitting on the back porch. Her dad comes outside to talk with her, and apologize. The basketball hoop in the background also symbolizes her childhood, and spending time with her dad. The proud father and daughter walking down the aisle. What a 1990's classic movie.